Open the Identity tab, and select the Hosts subtab. Click Add at the top of the hosts list. Fill in the machine name and select the domain from the configured zones in the drop-down list. If the host has already been assigned a static IP address, then include that with the host entry so that the DNS entry is fully created. Optionally, to add an extra value to the host for some use cases, use the Class field. Semantics placed on this attribute are for local interpretation. 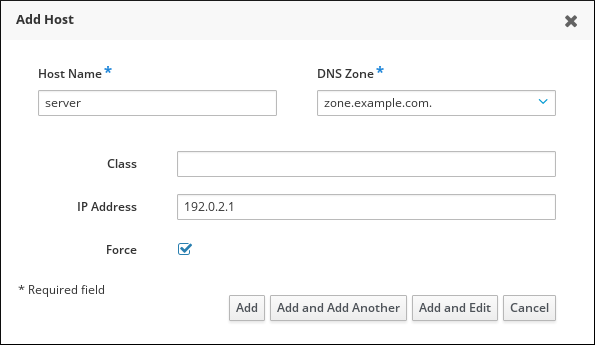 DNS zones can be created in IdM, which is described in Section 33.4.1, “Adding and Removing Master DNS Zones”. 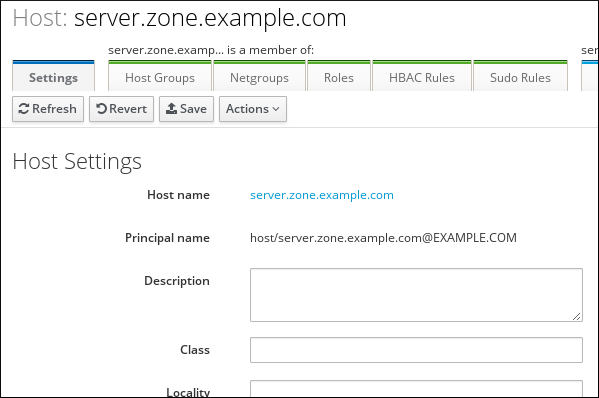 If the IdM server does not manage the DNS server, the zone can be entered manually in the menu area, like a regular text field. Select the Force check box if you want to skip checking whether the host is resolvable via DNS. Click the Add and Edit button to go directly to the expanded entry page and fill in more attribute information. Information about the host hardware and physical location can be included with the host entry. If the IdM server is configured to manage DNS, then the host can also be added to the DNS resource records using the --ip-address and --force options. Commonly, hosts may not have a static IP address or the IP address may not be known at the time the client is configured. For example, laptops may be preconfigured as Identity Management clients, but they do not have IP addresses at the time they are configured. Hosts which use DHCP can still be configured with a DNS entry by using --force. This essentially creates a placeholder entry in the IdM DNS service. When the DNS service dynamically updates its records, the host's current IP address is detected and its DNS record is updated. Host records are deleted using the host-del command. If the IdM domain uses DNS, then the --updatedns option also removes the associated records of any kind for the host from the DNS.